I have heard so much about Sri Lanka; people says it’s romantic, cultural, wild & untamed with pristine beaches. Problem was when I started researching for things to do on the island, nothing really stood out. I guess we just had to go with the flow and find out for ourselves. We decided to go with public transport as opposed to hiring a driver. While a driver would be convenient for our circuit tour, we wanted to do our thing at our own pace, without worrying about the drivers’ accommodation and meals. Buses are abundant, frequent and cheap throughout the country, so we just winged it as we went along. The express bus from the airport to Colombo Fort bus station costs 110 LKR per person, took just under an hour as the traffic slowed significantly when we got close to the city. From the bus terminal we tuk-tuked to the hotel. The next day we set off for Dambulla (Bus 48 or 49 towards Trincomalee). Luckily we had seats for the 5-hour bus ride, it became crazily crowded. The ride was comfortable as long as the bus kept moving and the wind was the natural A/C, otherwise the blaring music, humidity and a full bladder could make the journey less bearable. 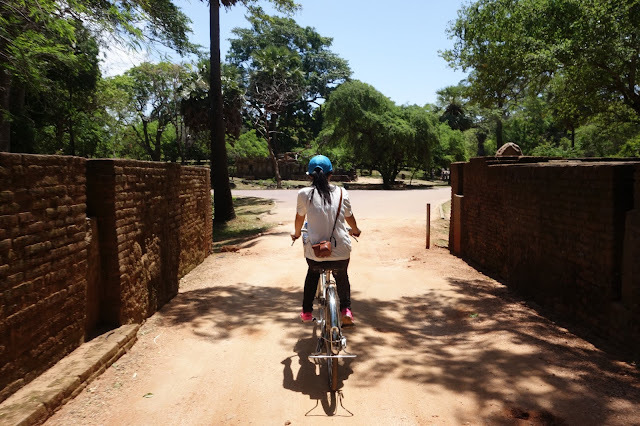 There was a pee break around 4.5hrs in, near Dambulla. That loo, however, was possibly one of the worst I have seen, including the ones in China. The bus dropped us off at Dambulla town centre, and our guesthouse was near the cave temple (2km). We could have called our host for a pick-up but we didn’t get a local SIM card (apparently it’s really cheap, we just prefer to be off radar). It was almost 4pm by the time we settled down, so we strolled over to the Cave Temple. 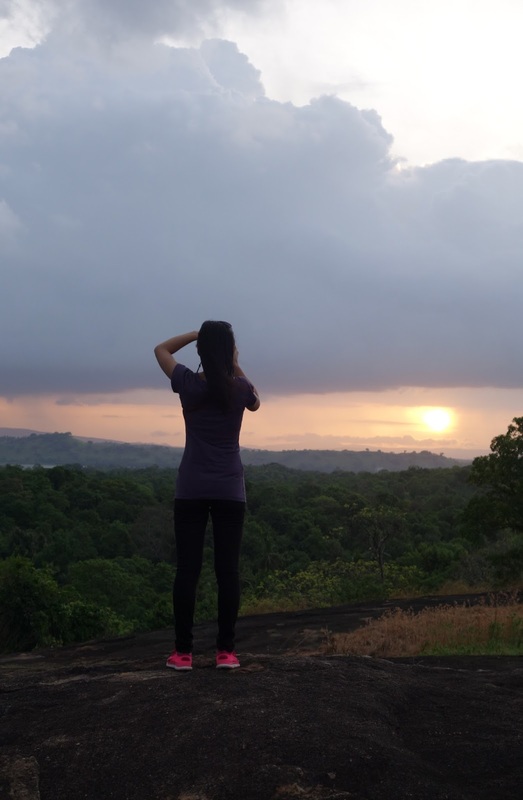 Our host offered to take us to a nearby hill to watch sunset. It started off as windy, but as we climbed higher it was more like gale, and we were told it’s unsafe to climb any higher. It was a hot day, like scalp-burning, soul-melting kind of hot. 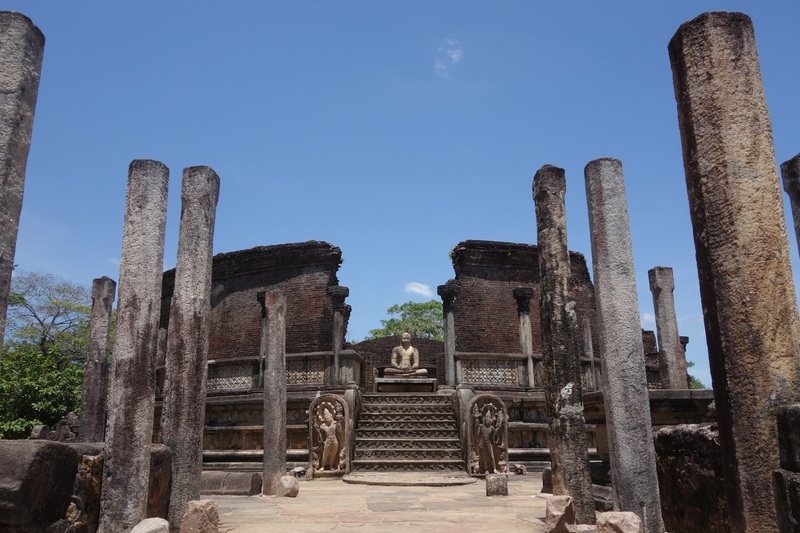 While the Sacred Quandrangle with a compact collection of ruins was impressive and the Vatadage was cool, the sun was slowly dissolving our will to linger too long under the scorching sun. 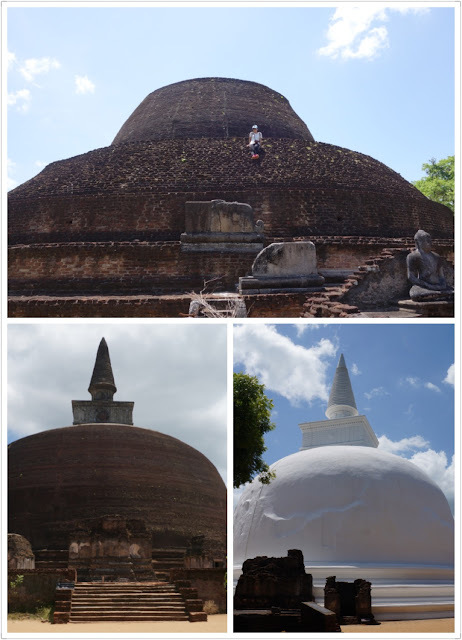 We ploughed on to Pabalu Vehera, Rankot Vihara and Kiri Vihara for the King’s Queen dagoba, some of the biggest and best preserved in the country. 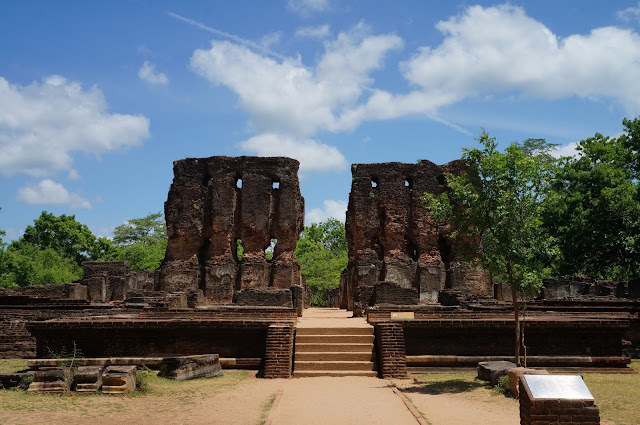 I really enjoyed the serenity of the ancient site and the relative lack of tourists, but it is also less spectacular compared to the magnificent structures in Bagan or even Angkor Wat. There were no food stalls or restaurants in the ruins area, we were getting pretty hangry, and someone else’s driver suggested Banana Leaf back in new town. So we finished off with the granite buddha sculptures at Gal Vihara and headed back for lunch. Turned out to be one of the best rice & curry we had. The grilled fish was okay, quite a lot of small bones in the fish. The guesthouse made us chicken kothu roti (stir-fry shredded roti) for dinner, one of the less salty ones we have had on the trip. Like a lot of developing countries, food in Sri Lanka is heavy on salt and MSG. 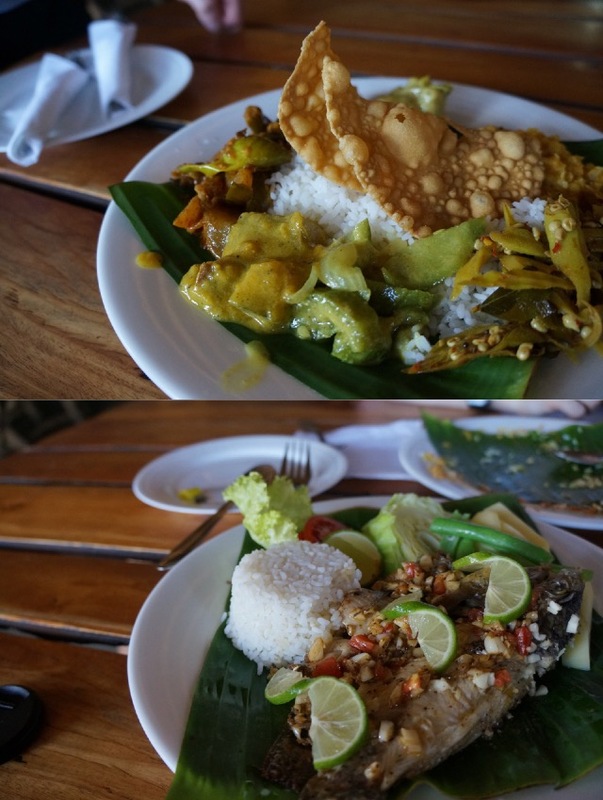 We found that guesthouses are generally better than random eateries on the streets. The following morning we took a trip to Sigiriya, just over 30mins from the Dambulla. 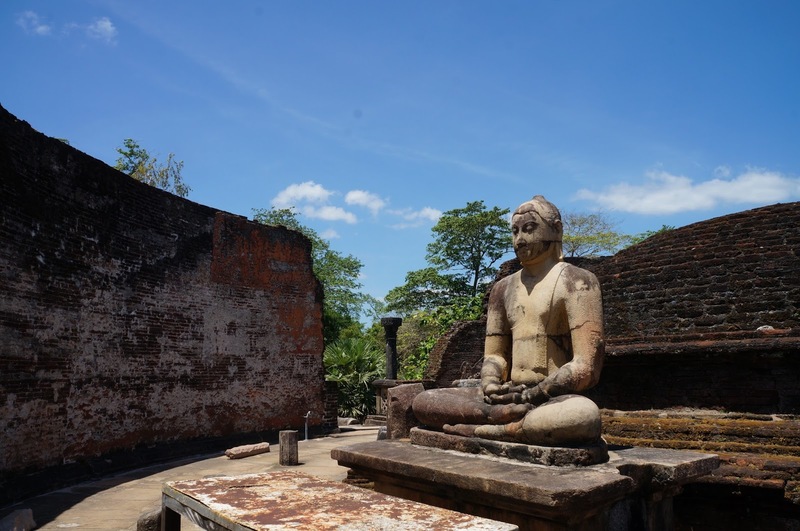 The 200m tall rock fortress is the most popular tourist attraction in Sri Lanka, so it was no surprise that we were joined by some Chinese tour groups. The ‘Quiet - Beware of Hornets’ signs generally did the trick to keep their volume down though. The climb was relatively effortless, made quite comfortable with the strong breeze as we ascended. In my honest opinion, Sigiriya isn’t worth the 4200 LKR entrance fee; there was nothing left on the mirror wall except for modern day vandalism, I’ll refrain from commenting on the quality of restoration work on the frescoes, the gardens were basic and nothing of the palace remains standing on the rock plateau. 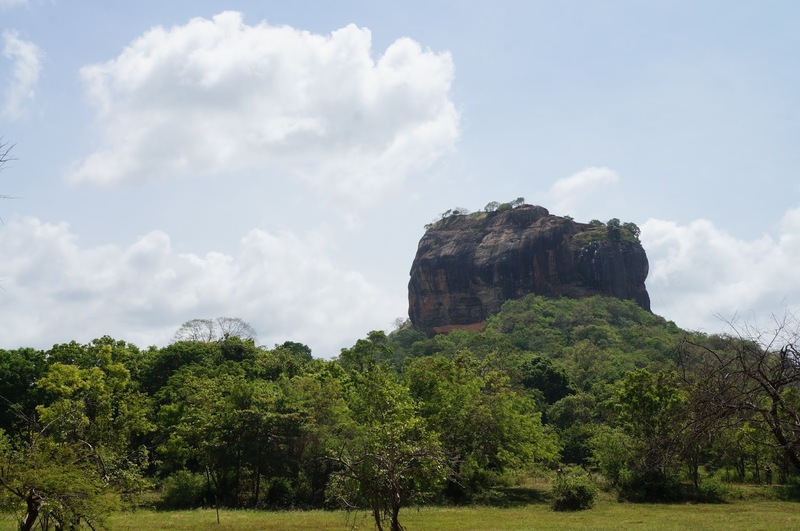 Given the choice again, I’d rather climb the mountain next to Sigiriya, to get a good shot of the lion rock itself. Our guesthouse kindly offered us a room to shower before we set off to Kandy. We were lucky to pick up a 16-seater air-con bus this time. 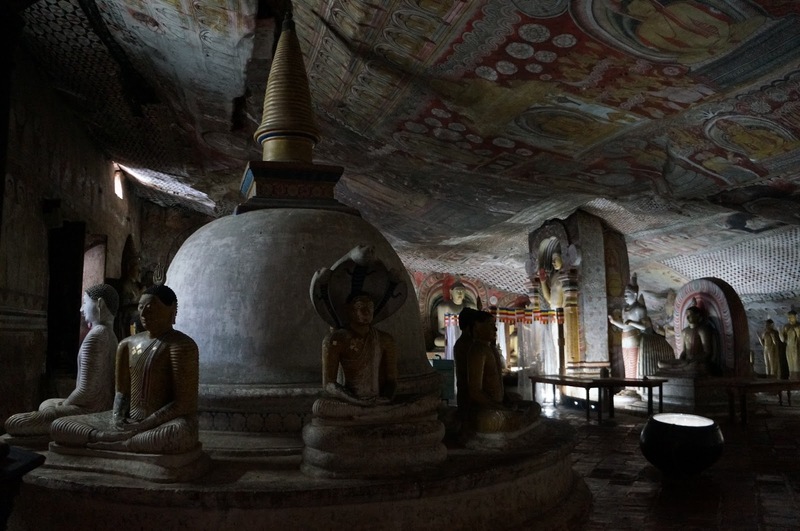 Well… as much aircon as it could manage, minus the crazy music plus a Sri Lankan HBO movie! We were dropped off at Kandy city centre after the 3-hr ride. Booking 2 nights of accommodation in Kandy was a mistake. The original thinking was to get a good night’s sleep before our overnight Adam’a Peak trek, and there are more reliable accommodation options in Kandy. However we ran out of things to do in Kandy after 3 hours. The city centre was compact and messy; the ‘state-of-art’ shopping mall was empty; the side streets were dark and dodgy; restaurants were uninspiring and the streets were packed with tour group tourists. Seeing none of the recommended eateries seemed appealing, we found a couple of London Urbanfest-style pop-up food stalls in the park, one was selling wraps and burgers and the other were offering Sri Lankan delicacies. We went for a spicy chicken wrap in the first stall, then a ‘creamy kothu’ from the second one. The chicken wrap was off-the-scale spicy; so much so that it jolted his memory back to Burger Singh in India about ordering spicy food in a spicy country. The creamy kothu was one of the best dishes on this trip. Chef reined in on the salt and the generous cream turned this into a carbonara kothu - scrumptious! 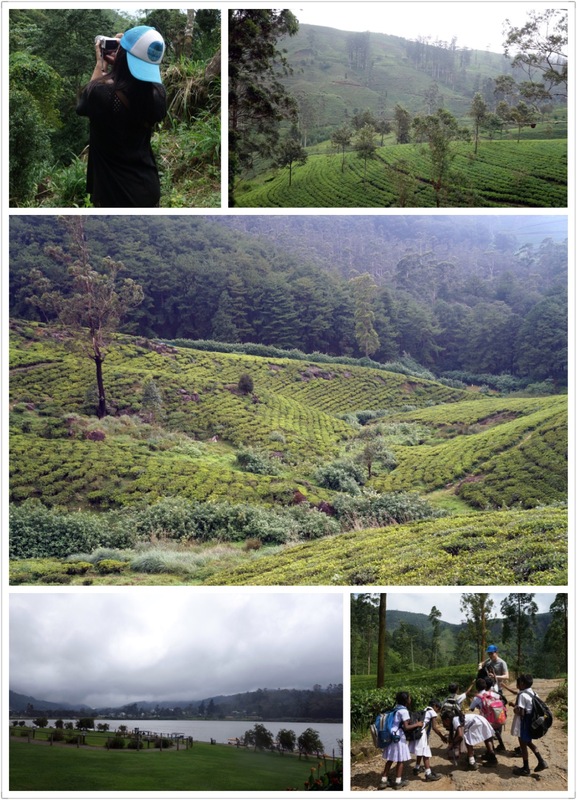 On day 5, instead of lazing around in Kandy, we decided to take a day trip to Nuwara Eliya. Initially we planned to get the bus from Good Shed station, but our tuk tuk driver talked us into renting him for the day (4000 LKR), and he’d stop at waterfalls and tea plantation fields, which we wouldn’t be able to do with the bus. 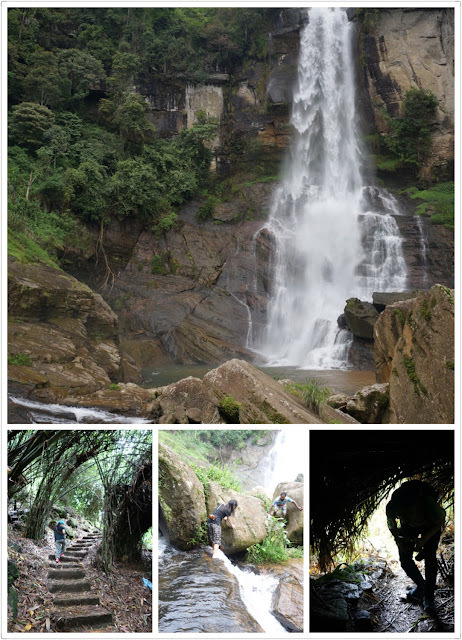 We stopped near Ramboda Waterfalls and he led us up this little trek upstream to get closer to the waterfall. Then we took our shoes off and waded across the slippery rocks to get a feel of the cool refreshing waters. It was great fun and we agreed this climb was more onerous than the Sigiriya walk. Our next stop was Blue Field Tea Plantation Factory, where we had a guided tour of the tea-making process followed by some tea and cake. While strolling around the tea fields, we were ‘ambushed' by a group of young school kids that were excited to get a pen from a foreigner. Of course he had a pen… probably had a spare one too... they were quite sweet. This area is known as Little England, due to its altitude and its cool climate. Our driver took us to Nuwara Eliya town centre, which was dotted with beautiful English-style cottages. We went further north to Gregory Lake. This was when the weather turned truly British. My body has adapted to heat and humidity, it doesn’t agree with gushes of bitter wind and the grey skies spitting down. He, on the other hand, seemed perfectly comfortable with the ‘cool’ temperature and enjoyed the knock-off Mickey Mouse by the lake. It was way too cold to grab lunch at the food shacks by the lake, not that we were interested in hot dogs and pastas anyway. After a kothu and some egg hoppers, we began our descend back to Kandy (and warmth), stopping at various vegetable and flowers stalls as our driver did his shopping and moaned about how expensive everything was. To break up the journey from Kandy to Adam’s Peak, we took a detour to kitulgala for some white water rafting. There was no direct bus to Kitulgala from Kandy, we took a bus to Nawalapitiya, from there another bus to Ginigathhena, then change for another bus towards Colombo via Kitulgala. The first two legs were fine, fairly long journeys with frequent stops, but my bladder held out and we had seats. The last leg from Ginigathhena was an overflowing bus on a meandering road with sharp bends and turns, and by overflowing I mean he was hanging off the door while I was sandwiched between the driver’s seat and a stack of 3 men sitting on top of each other. It was a gruelling 30min ride. The kilometre near Kitulagala was lined with various white water rafting operators. We hopped off the bus and was got picked up by a couple of guys that run Aqua Adventures. Given it was low season, the town was sleepy and the guys were enthusiastic to get our business. We were swept to their base where the rafts and gear looked new and well-maintained. The guys said 2000 LKR per person; we got changed in the shack, they packed the raft onto the van and we drove upstream. After some briefing and basic instructions, we got wet just by splashing water. It was lots of fun. The rapids weren’t crazy, nothing like the massive Padas River (Grade 4) in Sabah or the off-the-scale one he’d done in Uganda. This was quite mild and relaxing, a couple of gentle rapids with no real risk of getting thrown into the water. In fact after we got through one of the bigger rapids, we got out of the raft, swam / crawled / got dragged over the slippery rocks, climbed onto the highest boulder and took a plunge. That was pretty cool. We swam the last stretch of the river; the water was clean and refreshing. Then we were brought back to the base to get changed and dry off. There was a miscommunication as the guys said they thought we agreed on 3000 LKR each; we settled for 5000 LKR for 2 in the end - it was a genuine misunderstanding. They helped us flag down the bus to Hatton and off we went. 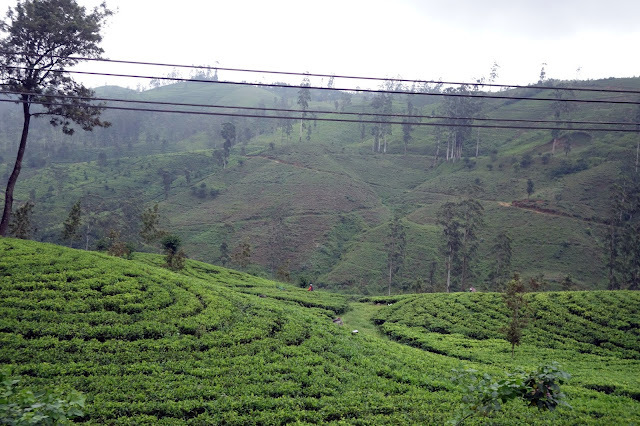 The bus to Hatton took about an hour, and it was a very scenic bus ride next to rolling landscapes of tea plantations. 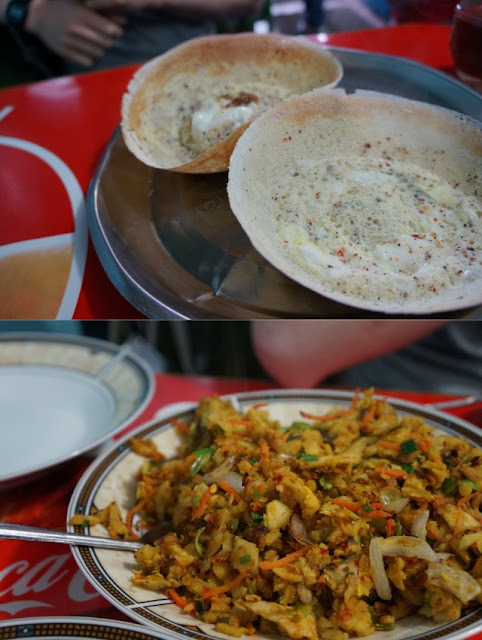 It was about 4:30pm and we had some egg roti and fried rice for a late lunch. The town was quite busy and we were approached by many tuk tuk drivers to take us to Adam’s Peak, even went as far as telling us there were no more buses because it was late. Liars. He disappeared in the bus terminal, and just as I started to panic and was getting surrounded by drivers, he re-appeared with the bus to Dalhousie. Timing worked impeccably. We arrived at Dalhousie just after 6:30pm, had just enough time to freshen up before watching England beat Wales in Euro Championship over a simple dinner. Then it was early bed for a 2am rise for the trek up Adam’s Peak.